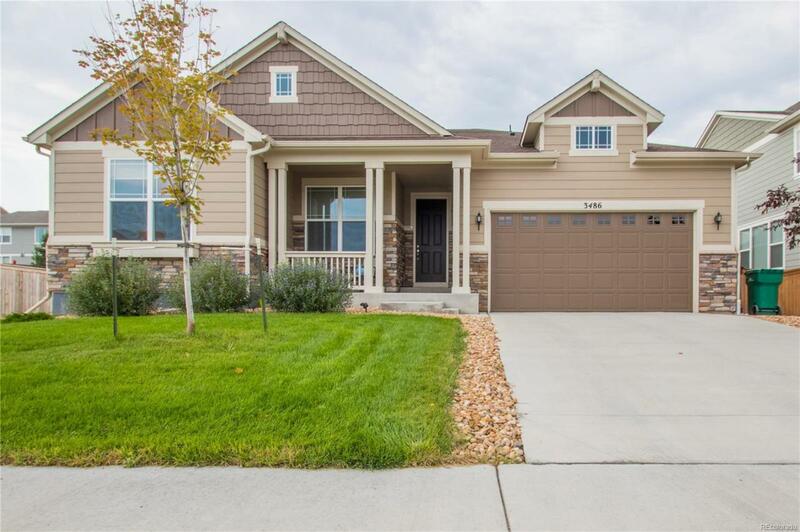 Almost new ranch house in a great Thornton neighborhood! Three bedrooms, a dedicated study room, and 2.5 bathrooms all on the main floor. Master bedroom features an attached bathroom with two sinks and two separate walk-in closets. Upgraded Chef's Kitchen with all stainless Kitchenaid appliances, extended cabinets, and large pantry. Huge unfinished basement pre-plumbed and ready for customization. An extra large corner lot, a fully fenced backyard, and a huge colored, stamped concrete patio add to both indoor and outdoor living. Only a few minutes from the new Amazon center, Orchard Town Center, and future Denver Premium Outlets make it a choice location. There are also lots of adjacent trails, parks, schools (elementary and middle), and future RTD light rail train station within walking distance!